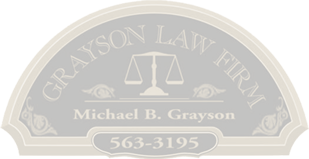 If you have been in an accident in southwest Montana where the other driver was either an uninsured motorist or an underinsured motorist you should have your case reviewed by an experienced, aggressive, and honest attorney like Mike Grayson at Grayson Law Firm. We will give you a free evaluation of your claim. Mike will review your case with you and then let you know how strong your claim is and what legal action or administrative action can be taken. It doesn't matter whether you were injured on a city street or an interstate highway by an underinsured driver, you deserve to have an honest lawyer who knows the right way to work with insurance companies and to press action against the uninsured motorist. Unlike many law firms, we will be happy to discuss your case in detail with you over the phone - call (406) 563-3195 to set a time - but you are always welcome to come into our office at 112 East Commercial Ave. in Anaconda, Montana, and meet in person if you prefer. You have nothing to lose by contacting us today for a free, no obligation appointment. We will take your case on a contingency fee basis. That means you pay no fees up front, and you will owe us nothing if we fail to get you a settlement or a jury verdict in your favor. At Grayson Law Firm we may obtain settlements for our southwest Montana car accident clients without having to go to trial. But, with over twenty years and two dozen cases tried over those years, Mike has the experience to get good results for cases that do go to trial.